When it comes to desserts, I’m not much of a cookie baker. 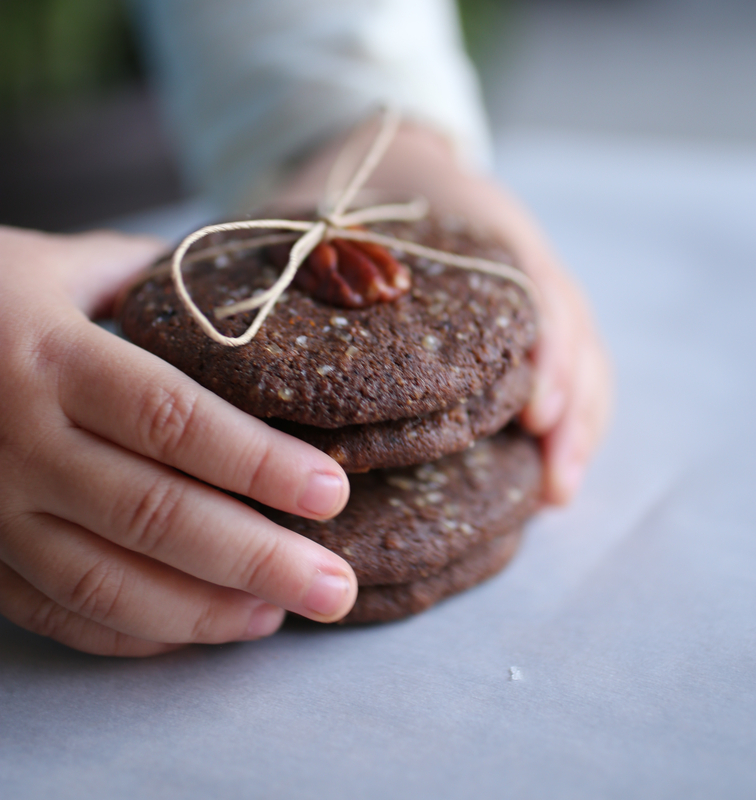 I’m usually the cake maker, but I thought it’s about time I share a cookie recipe on the blog. So, I made cookies for you today. 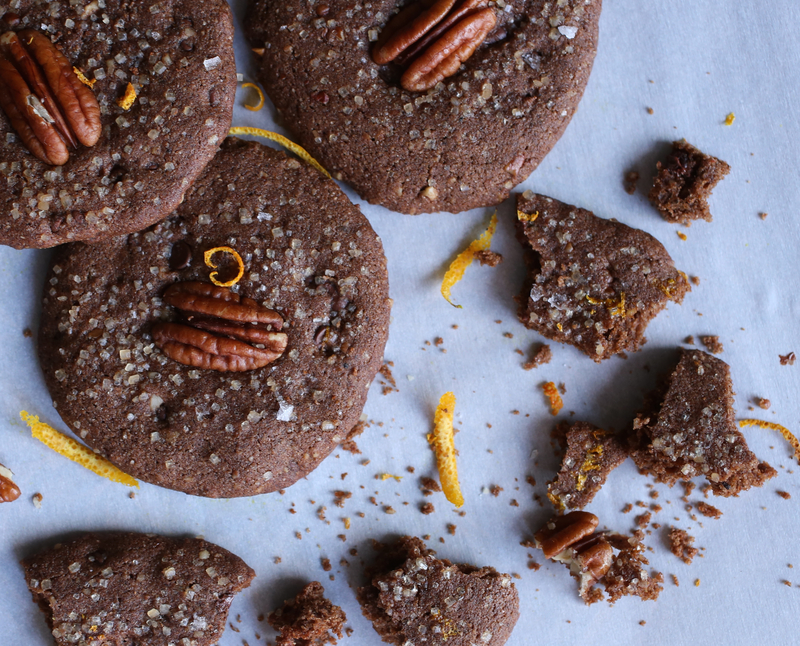 Flecked with orange zest and studded with crunchy pecans, these semi-crispy cookies are fragrant, full of cocoa and spiced with freshly ground cardamom. They’re also vegan, gluten free, and perfect with tea, coffee or a glass of your preferred type of milk. The recipe from which I drew inspiration to make these cookies called for coffee, instead of cardamom and orange, to flavor these cookies. I first followed the recipe, making the cookies with coffee and a few adaptations. I found them to be quite lovely and flavorful, but as I’m not much of a coffee drinker, I came up with another flavor profile. Chocolate with orange and cardamom came to mind. If you’re also interested in the coffee version, see my notes below. In a large bowl, combine flours, sugar, cocoa powder, cardamom, baking powder and salt. Add coconut oil to the dry ingredients and mix with your hands until the mixture becomes like sand, about a minute or so. Add milk, orange zest, and vanilla. Mix with your hands forming a large clump of batter. Mix in pecans and chocolate chips. On a baking sheet lined with parchment paper, drop the batter, spacing the cookies at least 2-inches apart. With the back of a spoon, a spatula, or your hand, flatten the balls to form a flat disk. 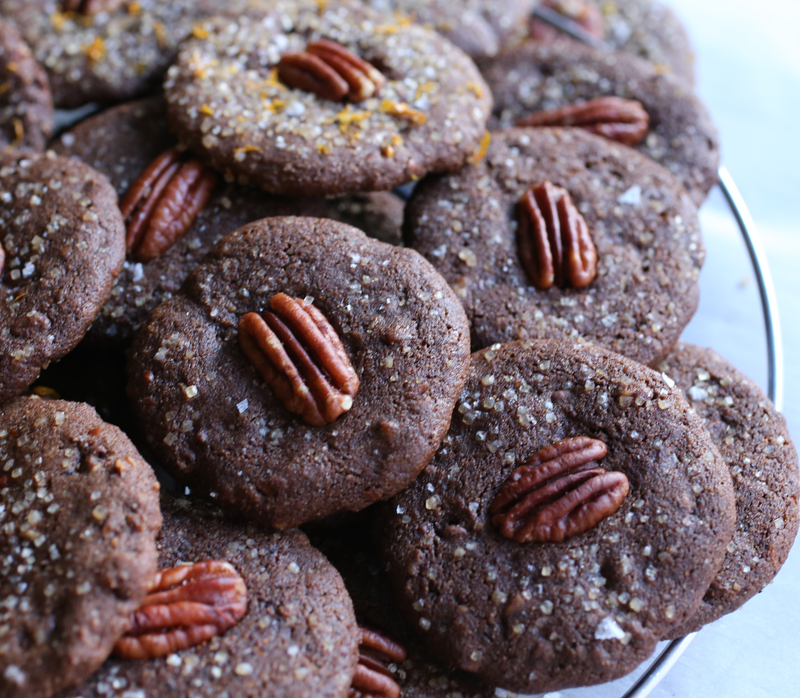 Place a whole pecan in the center of each cookie and sprinkle with turbinado sugar, flaky sea salt, and orange zest, if you like. For a bit of zing, you can also sprinkle with cayenne pepper, if you like. Bake in the oven for about 15 minutes. Allow cookies to cool on a wire rack to harden. Serve with tea or coffee. Notes: Using a mortar & pestle, I freshly ground my cardamom, but you can use already ground cardamom, if you like. The original recipe called for a cup of sugar but since I planned to sprinkle the tops with turbinado sugar, I decreased the amount and think it could be further decreased to a ½ cup of sugar. I preferred to ground my pecans well before adding them to the batter. If you like larger chunks of nuts in your cookie, coarsely chop the pecans and omit the optional whole pecan topping. If possible, use an organic orange for zest to avoid absorption of pesticide residue. For those of you wanting a vegan recipe, use vegan chocolate chips. For the coffee version, follow the same recipe above, but instead of using cardamom and orange zest, add 3 tablespoons/15 grams instant coffee granules to the dry mixture. Besides the difference in flavor, the coffee flavored cookies were a little darker. They can be seen in the photo just above, they’re the ones without the orange zest. I had my son help with the sprinkling of sugar to the final batch. He got a little carried away. As you can see they are loaded with turbinado sugar, not what I’d recommend, but we had fun sprinkling together! Thanks Amanda, I appreciate it! What beautiful and delicious cookies! 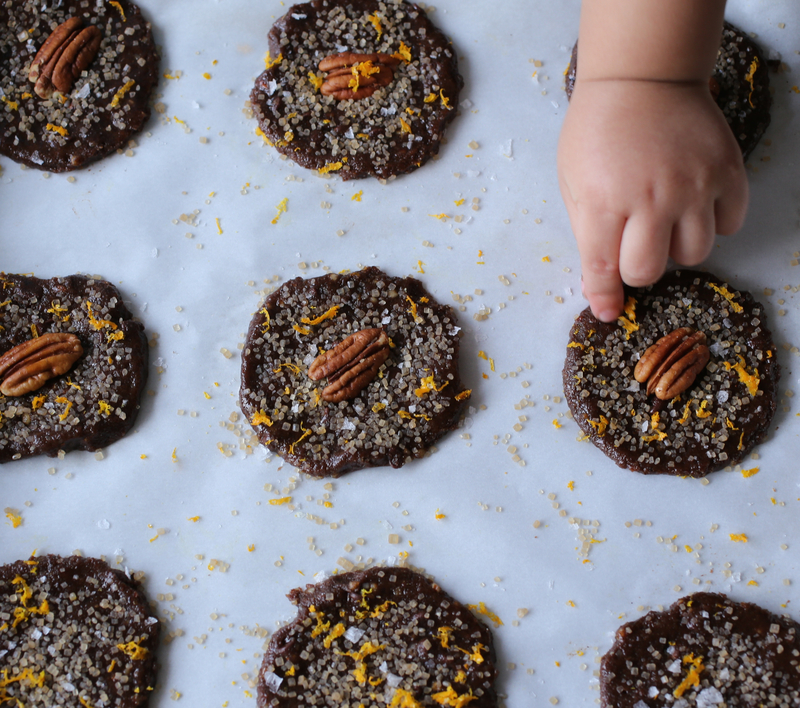 love the combination of chocolate and orange – so I bet they were so delicious. Thank you much! Yes, we liked the combination too! 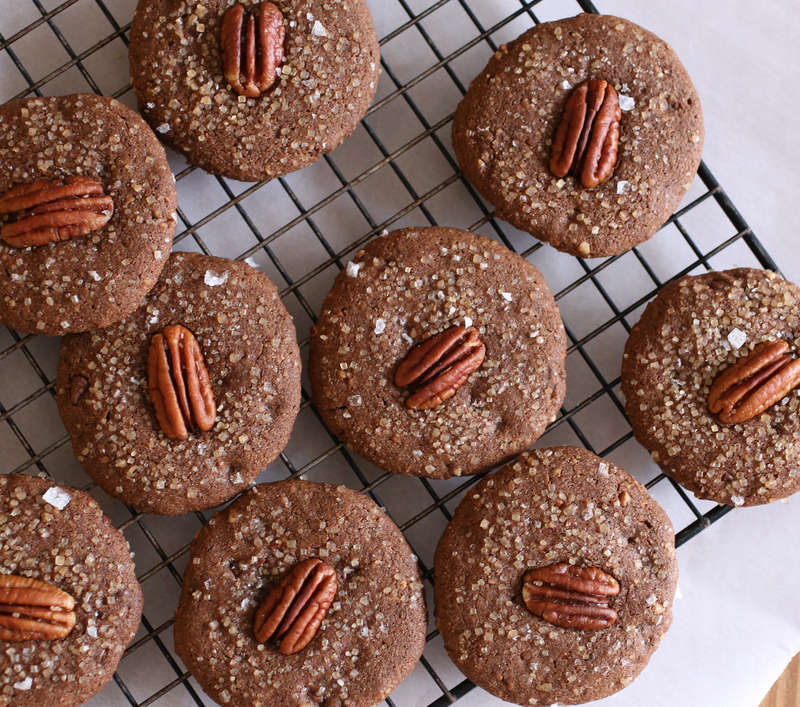 I made a couple of versions of these amazing cookies and totally love them! The combination of orange, cardamom and chocolate is truly blissful! I used spelt and buckwheat flours and also added cinnamon. I am very excited about trying some more of Martine’s exquisite creations! Wow, these look and sounds amazing! Hi Chez, Thanks so much! I hope you like these cookies! They’re pretty versatile so feel free to experiment with the recipe. Would love to know how you like them if you make them!